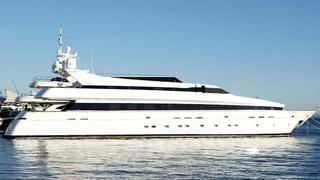 Nigel Wales at Arrival Yachts tells me he's now signed the 43.6m motor yacht Cap de Quers for sale. She's a classic 2006 Cantieri di Pisa design, both exterior and interior and is one of the yard's Akhir 145 series. At just over 43 metres her trideck layout can sleep up to 18 in an owners suite on the upper deck, VIP stateroom at main deck level and six further cabins. Twin 16V 4000 MTU engines give her a top speed of 24 knots. Lying in France, Cap de Quers is asking €10.9 million, tax paid.